Dieters sometimes need a little help battling those South Beach sugar cravings. While many people begin the South Beach Diet with enthusiasm, they often find themselves struggling with those overwhelming sugar cravings that come and go throughout the day. If you are one of those people, don't despair. This article will show you how to make the most of the diet and conquer those cravings as well. One of the best things about the South Beach Diet is that it encourages snacking. That's right, you can munch, munch, munch, as long as you are munching on good snack food. What's good snack food? Foods like nuts, raw vegetables, and low-fat cheese make great snack choices. One of the biggest roadblocks in dieting involves overcoming those powerful cravings…cravings which typically involve foods that aren't healthy or even satisfying. The science behind the South Beach Diet is simple. Because it is a carbohydrate-restricting diet, it focuses on foods that are low on the glycemic index and low in saturated fats. Foods like nuts, eggs, low-fat cheese, vegetables, and lean meats are the basics of this diet. The diet also emphasizes good carbs, including fruits and whole grains. Carbohydrate cravings actually escalate from a high carbohydrate diet. Cravings result from high levels of insulin in the body, which have developed from foods high in fats and sugars. Probably the most difficult phase in the South Beach Diet is Phase One. During this phase, which lasts for two weeks, the purpose is to erase the dieter's cravings for high glycemic index foods, such as bread, pasta, potatoes, rice, and sugar. Other foods which are restricted during this first phase include alcohol, cereal, fruits, and even vegetables like carrots and corn. Protein-rich foods are stressed, however, and these may include eggs, cheese, lean meat, fish, nuts, and other vegetables, such as broccoli. Coffee and tea are also allowed, but they must be free of additives such as sugar and sugar substitutes. A balanced diet includes three regular-sized meals each day, with mid-morning and mid-afternoon snacks included, as well as a dessert. The purpose of this phase is to change the body's chemistry and reduce or eradicate the body's powerful sugar cravings. At the same time, rapid weight loss usually occurs. For those just embarking on the diet, South Beach sugar cravings may be the number one obstacle that stands between you and success. You can battle those sugar cravings, though, and once your body's chemistry changes, the cravings will become less severe. Eventually, you shouldn't have to struggle to stay away from the sugar-laden snacks that are hidden in your pantry. Until then, however, there are some steps you can take to succeed in your efforts to lose weight. Change your buying habits: Have you ever noticed how snack foods are scattered throughout the grocery store? This wasn't done without some serious merchandising strategy. If they don't tempt you on one aisle, they may get you on the next one. Be ever vigilant by sticking to your grocery list. Browse those aisles as if you are wearing blinders. Purchase only what you've listed on your list, and steer clear of snack foods high in carbs and sugar. Buy healthy snacks: When those South Beach sugar cravings hit (and they will), be sure you have plenty of healthy snacks on hand. Be sure the snack falls into the approved category of the appropriate phase you are in. 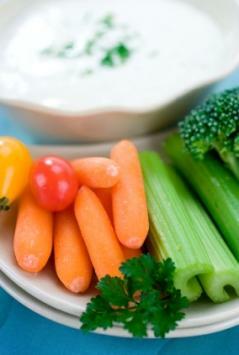 Keep plenty of raw veggies, nuts, low-fat cheeses, and other good-for-you snacks available. Don't give up: It's easy to throw in the towel when you've fallen off the wagon. Don't! Just start over again…and again…and again, until you finally establish a pattern in your daily eating habits and gradually lower those high sugar cravings. Don't give up even if you've had a bad day…or two…or three! Find a buddy: It's easier to diet when you have someone else to encourage you. Find someone to buddy up with as you diet. You can encourage each other and provide much needed support. Look for forums online as well. Finally, celebrate your success! Buy yourself that new sweater you've been eyeballing, spring for a massage, or purchase that new bestseller. You deserve it!